There’s a school of thought that mobile gaming can’t do big, complex games. The most popular are quick, simple and outrageously addictive little vignettes like Flight Control, Angry Birds, Flappy Bird and their ilk. By extension, handheld consoles’ titles aren’t a patch on their big ol’ tv-powered brothers. Apparently. This is to be expected, of course, what with technical limitations and such. Still, the humble 3DS has been doing some impressive things recently. 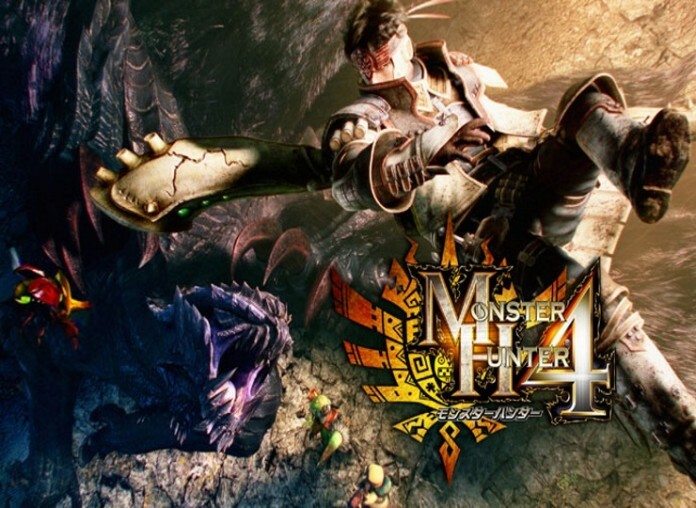 Smash Bros. was quite the package, and now here comes a truly vast game for the system: Monster Hunter 4 Ultimate. Franchise fans will remember the last title, which hit the handheld and Wii U simultaneously. This time, it’s 3DS exclusive, and one of the system’s most anticipated releases for some time. Let’s take a look. 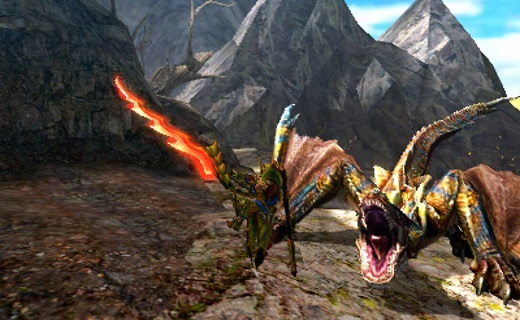 Monster Hunter, for the uninitiated, is an action RPG (well, technically) from Capcom. It casts you as a greenhorn ‘Hunter,’ a sort of mercenary charged with eradicating the big ol’ angry creatures that roam the world and threaten settlements. It’s all very action-centric, and we’re using the term RPG in the loosest sense. Loose enough to drop right off and roll under the sofa, at that. There aren’t many of the usual genre trappings to be had here. Sure, there’s a little hub town, prattling NPCs to talk to and item and equipment shops, but as far a plotting goes… there’s slim to bupkus. Between quests to murderise things, you’re really just in the hub to stock up on hunting equipment and upgrade weapons or armour. For Monster Hunter 4 Ultimate, little has changed in this regard. You’ll spend your time grinding up the ranks and building your HR (Hunter Rank), which is the key to accessing the bigger and claw-ier missions. To succeed there, of course, you’ll need more powerful weaponry and more resilient armour, which you can craft by defeating the monsters already available. And so the circle of Monster Hunter life continues. Missions take place in large habitats, with ten or 10 or so zones. You’ll have to stalk your prey between zones, marking them with paintballs when they fly away and other little intricacies. They’ll limp away when they’ve sustained too much damage, stagger from too many hits on a weak point, and otherwise act like the wild animals/bosses they are. This is a hunt, after all. The core combat is the name of the game, and Monster Hunter 4 Ultimate brings only slight tweaks to a winning formula. The real-time arcade combat is as slow-paced and deliberate as it ever was, emphasising positioning and timing over anything else. Button mashing will get you killed in moments. The beauty of these games is in correctly predicting where your foe will be and nailing them with a fully charged Great Sword hit, or getting in that final Roundslash to power up your Longsword as the monster staggers. There’s a wide range of weapon classes, each of which makes a huge difference to how you approach a fight. The fast and mobile Sword and Shield is a combo weapon, letting you apply lots of elemental or status hits quickly (the paralyse or poison effectively, in the latter case), while the devastating blunt damage of the hefty Hammer can KO monsters with powerful hits to the head. Whereupon it is left immobile for a while and ripe for a beating. There are also ranged weapons, in the form of the Bow and the Light and Heavy Bowguns. Gunners are a different type of hunter entirely, requiring a separate set of armour to their melee (blademaster in Monster Hunter terms) allies. In exchange for being able to attack from a safe(er) distance, their equipment has only half the defense by default. Monster Hunter, in all its forms, is a huge undertaking. Fans of grinding for rare drops and the like will take to it like nobody’s business. Crafting a particular monster’s armour set or weapon upgrade can take many battles with it, and demands dedication. It’s the kind of game where simply deciding to learn a new weapon class can grant you weeks of playtime. For veterans of the series, there are some rather nifty new mechanics and additions here. The first of which is mounting. During combat, you’ll find opportunities to perform jumping attacks on the enemy. Doing this correctly will allow you to land on its back and attack away, filling the mounting gauge. Doing so before the monster throws you off will result in a long stagger animation as it falls, allowing for ample free hits. There’s also (whisper it) a tentative attempt at adding a little more story this time around. Your hunter joins a travelling caravan at the beginning of Monster Hunter 4 Ultimate, and will move with them through various hub worlds; attempting to solve the mystery of an artifact held by the leader. It’s nothing big and complex, but it’s step beyond anything the series has tried in that area before. Which sums up the new installment perfectly. As always, Capcom’s flagship hunting game is a daunting franchise for new players to get into. It may ease you in with tutorial missions, showing the basics of gathering and simple weapon controls, but then you’re face to face with the Great Jaggi and getting your face chewed on (well, sometimes). New players certainly have a lot to take in, and this release is really no more noobie-friendly. If you couldn’t get into Monster Hunter before, this one will do nothing to change your mind. For me, it’s always been a series that you either invest hundreds of hours into or you don’t click with at all. The former camp will delight in the two new weapons, the tweaked ‘vertical’ element to battles, and the first portable release with true online functionality. A Western release has been long-awaited, and for many it’s a game of the year contender now it’s here.